Death Valley is a perfect example of a flying destination. It takes a long time to drive there. It takes much less time to fly there. Once you arrive, there are things you can do without having your own car (I recommend the Sunday brunch at the Furnace Creek Inn). Getting there is not without challenges though. If you draw a straight line between El Monte and Furnace Creek, you’ll find terrain and a LOT of Restricted areas and MOAs in the way. The direct route is not going to work. You should always plan for the likelihood that you will need to navigate around all the Restricted space. With that in mind, I break the trip into three basic routes. 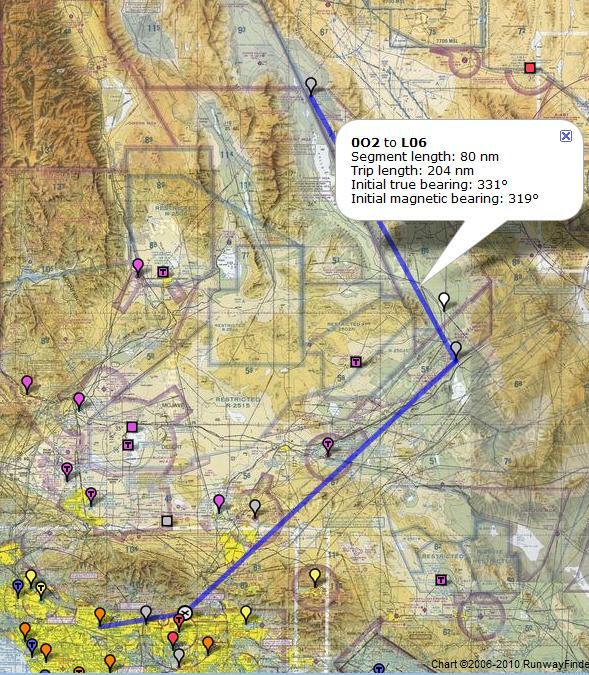 My personal preference is to take the Baker route on the way to Furnace Creek (hoping to get closer to Goldstone) and fly some version of the Owens Valley route on the way back (maybe with a detour to check out Mt Whitney). This is probably the easiest route to do via pilotage, i.e. the other IFR (I Follow Roads). Take the 210 to the 15, go to Baker, turn left and follow the road to Death Valley. On this route, I frequently find that some, or all, of the R-2502 areas are cold and I’m able to turn the corner earlier than Baker. If R-2502N is cold you may be able to fly over JPL’s Goldstone complex. The route, as shown will require you to make a small deviation around the edge of R-2502A. See this route on SkyVector. This is the shortest route, but also the most difficult route to navigate, unless you are following GPS or using flight following to help confirm your location. It is also the most direct if all the restricted areas are hot. You could go direct to Mojave, but I find I usually need to climb a little more towards the west (towards JPL ) to clear terrain in my climb. On the way to Mojave, I suggest keeping SR-14 off to your east to ensure you don’t stray into the R-2515 area. If you want an interesting view coming into Death Valley, fly closer to Telescope Peak on your way in. Take a look at the Trona Route in SkyVector. This route is pretty easy by pilotage as well, with some flexibility on where to cut across from the 395 to Death Valley. The Furnace Creek airport (L06) is below sea level. This is worth a trip by itself, just to see your altimeter wind below zero (with the proper altimeter setting). Once there, I suggest you call the Furnace Creek Inn for a shuttle to pick you up. In the past, there was a pay phone with which to call. More recently, cell phones seem to be working there. It’s a short drive to the Furnace Creek Inn (and reasonable walk there or back). They have a pleasant restaurant and an excellent Sunday brunch. It’s only open from about October to May. The airport has no taxiways, just a runway and a parking area. You’ll need to back-taxi on the runway after landing and in preparation for departure. It can be quite windy, so bring tie downs and/or chocks. There are cables to connect to, but usually no tie down ropes. Fuel is currently available, but it takes some effort to pay and have someone come over from the Chevron station on the main road (reported in March 2012 that fuel is no longer available at Furnace Creek). Remember that VFR flights may legally enter MOAs. I would however recommend flight following or confirming that the MOAs are “cold”. Flight following will usually be terminated 20 miles or more south of the L06, as you descend out of radar coverage below terrain. Reservations are recommended at the restaurant, especially for brunch. It can be very hot in Death Valley, but very cold at altitude. Dress in layers. Drink lots of water. This entry was posted in Destinations and tagged death valley, destinations, furnace creek by dgwerntz. Bookmark the permalink.